Has This Ancient Mystery Finally Been Solved? Does our genetic make-up determine our humanity? Is it our biological differences, our lack of body hair, the size of our brains, opposable thumbs or our ability to walk upright? While countless hours are spent investigating our biology, little time is invested in figuring out why we do the things we do, think the way we think and experience the world in the way we have. Stepping Out Of Eden combines information from theological sources and the mythic record with archeological finds to create a broad view of who we are and where the essence of humanity comes from. 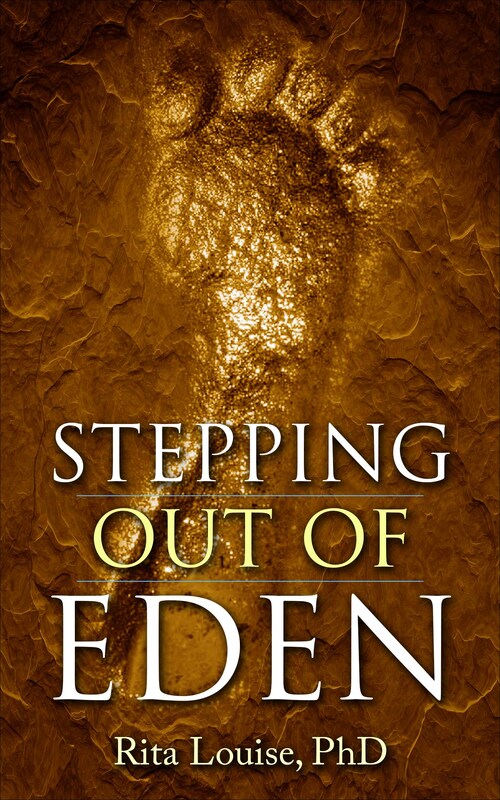 Stepping Out Of Eden picks up the story humanity that was left untold in my last book E.T. Chronicles What Myths and Legends Tell Us About Human Origins. E.T. Chronicles is a startling and comprehensive examination of ancient myths and legends that describe extraterrestrial visitors and their encounters with humanity since the dawn of time. It starts with “in the beginning” and ends with the advent of civilization. It tells tales of a time when the Gods walked the Earth. It takes a fresh look at the Gods of myths and legends as they appear in our biblical, oral and written histories. Over the centuries, there have been many different theories about which essential qualities and characteristics can be understood to be uniquely human. In Stepping Out Of Eden, Dr. Rita Louise explores an impressive body of comparative perspectives on the subject, drawn from many different fields of study. These range from archaeology and anthropology, psychology and behaviorism, to ancient mythology, spiritualism, shamanism, ritual, and religion. A comprehensive, informative and enjoyable read! This book is long overdue. It blends both sides of human endeavor both with style, insight, and clarity. It is pieced together in a cohesive narrative that leads on to a final question “Who Are We”. This book is without equal and long overdue. Stepping Out Of Eden, raises questions many of us have but few of us ask. Where do we come from? How did we arrive at our present state of evolution? Is there a purpose behind it all? Where are we headed? What comes next? In this wide-ranging, cross-disciplined montage, Dr. Rita Louise takes us behind oral histories, religious texts, and archaeological mysteries, to confront essential unknowns and ask important questions about our very existence as a species. Strap yourself in for quite a ride! 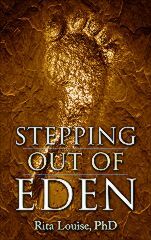 Stepping Out Of Eden presents a deep investigation of what the author calls the mythic narrative. And in doing so she exposes a trove of ideas from across a wide spectrum from fields of study which easily helps the reader to find a firm understanding of who we are. Unafraid to tackle controversial theories Dr. Rita Louise ushers in with firm intellect and experience to demonstrate a systematic break down process explaining just how complex we are as a species. And I would add that after reading this book, how ambiguous our world and our ancient history continue to remain. But no longer are they so elusive that we find ourselves hindered in our efforts to continue seeking answers; and especially with the help of Dr. Rita’s new book. It helps! From ancient medicine, rituals to myths, she manages to present well written and brilliant ideas revealing a structured and fun methodof thought. This is a book I strongly recommend. Dr. Rita Louise has an uncanny ability to not only swamp us with fascinating facts about our ancestry, but leaves us in a state of amazement at the depth and complexity of her research. Whatever we may have thought of our ancient history, Dr. Louise will turn it upside down, substantiate her conclusions with an abundance of facts from diverse sources. All this to solve the mystery of what it is to be human. A new mystery unfolds on every page. The book reads like a detective story which leads us to most surprising conclusions. Don’t miss it. It will amaze you, but most of all; it will leave you greatly surprised.